Everything on Planet Nubium — from the weather to the economy to the transport systems to a myriad of gadgets — is controlled by a supercomputer, but it’s malfunctioning. Negotiate levels and collect objects to make the password that reboots the machine. A rocket will propel your character upwards and gravity will pull you back down again. Avoid the guardians and keep an eye on the limited fuel! After collecting all the objects, return to the spaceship to advance to the next level. 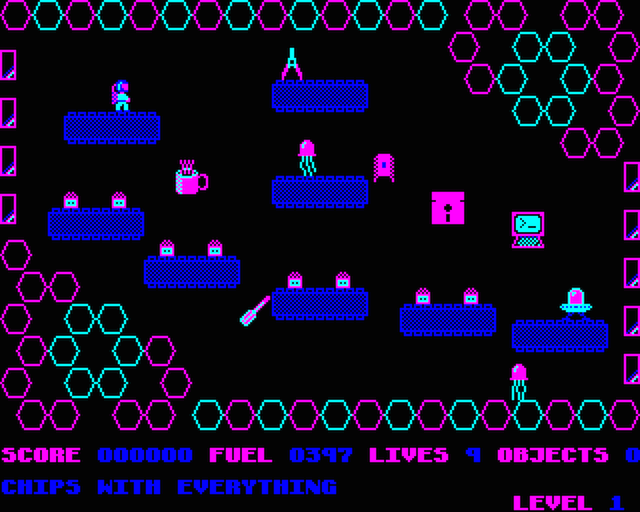 Planet Nubium is a new, original game for the BBC Master. More details at Stardot.